Immersed in Coptic liturgical, Arabic and European music, Mina's relentless zeal for his work results in a fulfilling musical experience, demonstrating remarkable skill & versatility. The ability to tell a story through music alone is the mark of a skilled musician. Mina’s lifelong passion for music has played a crucial part in his own story, as this fine Egyptian soloist, multi-instrumentalist, composer, arranger and producer found himself seeking asylum in the UK in 2012 when rising threats of persecution as a Coptic Christian in Alexandria made it no longer a safe environment for him and his family. Mina’s musical journey began in his childhood and led him to pursue studies in musical education at the University of Alexandria. As a self-taught oud (Arabic lute) player, he was an active performer at a local Coptic church before attending university. Upon graduation Mina became a music teacher at the university, and subsequently began his career as a soloist at the Egyptian Opera House in the Oriental Orchestra. A musician to the core, Mina strived to become more immersed in all aspects of the art form and so began composing, producing and arranging music. He prepared scores, offered vocal coaching, worked as a Maestro’s assistant and as a sound engineer for professional sound studios. 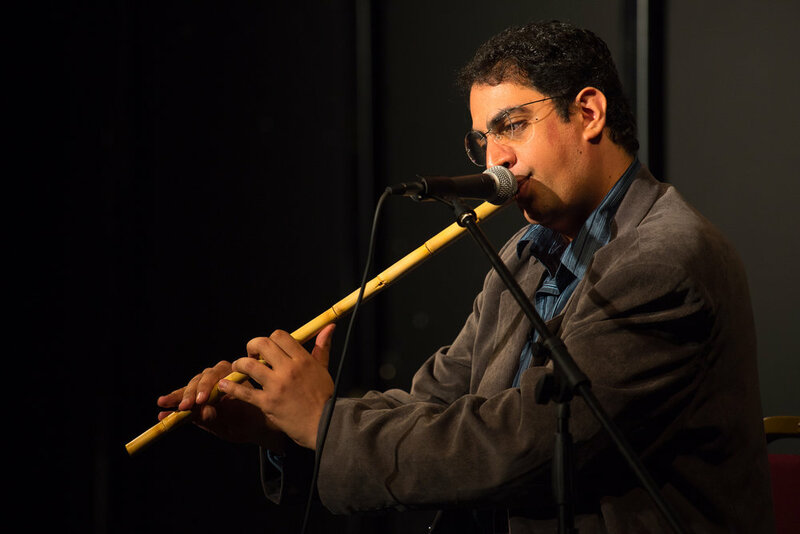 The multi-instrumentalist plays the oud and ney (end-blown flute), alongside the piano, oriental violin, mandolin and recorder, and a range of other Middle Eastern instruments. Once settled in Doncaster, Mina quickly became involved in both Arts on the Run and Rafiki Jazz - the world music collective, and now regularly performs & records with other active members of those Yorkshire-based communities of musicians, as well as with the singers Haymanot Tesfa and Sarah Yaseen. He collaborated with the visual artist Ayşe Balköse and film director João Paulo Simões on a commissioned project Journey of UnBelonging, exploring the un-settled environment refugees and asylum seekers find themselves facing when leaving their homes. This multimedia live performance project allowed Mina to amplify the story of refuge which he himself had to experience, and the collaboration proved to be a powerful opportunity to reach wider audiences. This multimedia live performance project allowed Mina to amplify the story of refuge which he himself had to experience, and the collaboration proved to be a powerful opportunity to reach wider audiences. Currently Mina is a member of the Coptic Orchestra, the Manchester International Roots Orchestra (MIRO), the Oxford Maqam and Rafiki Jazz, and performs at festivals and concerts across the country. Mina works closely as an associate-artist with Arts on the Run and with producers Konimusic, and is an emerging, in-demand talent on the world music scene. — Mina during his interview for Refugee Week in 2017.